Apart from their regular homework, our students were asked to do a writing about their main feelings and experiences of living and studying here. During this week, some of those reflections will appear on this blog, so we will be able to understand better their own point of view. Victor Pino is the only student from Las Fuentes at his school, but he has adapted soon and fine to the situation, making new friends and having great experiences in many different fields. As he reports in his writing, “La comida está súper buena, pero no sé si estar contento o asustado porque ya me he acostumbrado al brócoli”. Furthermore, he has perceived significant differences regarding the school: “El colegio es un cambio muy grande porque comen dentro del aula y hay tres patios a lo largo del día”. 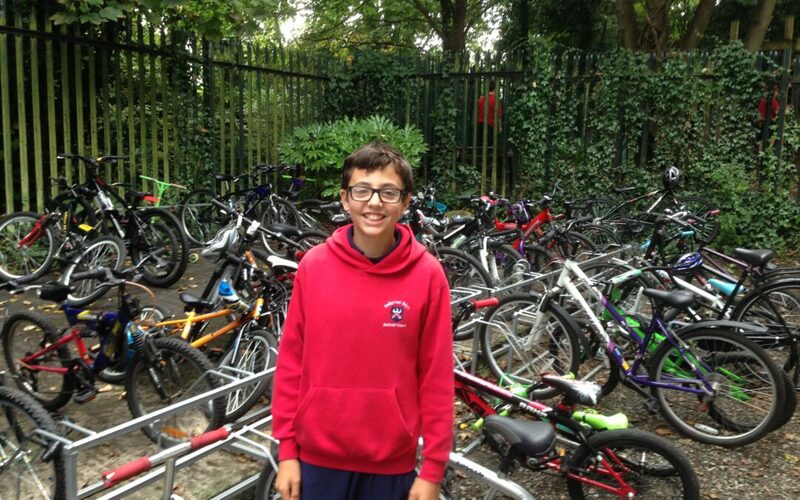 There is a bicycle parking at Ballyroan School, where Victor studies. Meanwhile, Victor Fernández de Bobadilla also goes on his own to the school. He is a veteran here, not being this year his first on irish land. He was decided to repeat the experience, and goes cheerfully to St. Attractas school every day. As Victor sums up: “He estado my bien en Irlanda porque la gente es muy maja y la familia que me ha tocado cocina muy bien”. He is right, as irish people highlight because of their kindness. Additionaly, Victor ends up his work by saying: “Lo mejor ha sido que he hecho un montón de amigos y he aprendido mucho inglés”. There are wonderful sport facilities at Victor’s school, like those tennis courts.